Spending time with your family at the beach is so much fun. You’ll definitely have a great time splashing in water or simply relaxing under a pop-up tent or large umbrella listening to cool music or simply watching your kids engage in a wide range of water sports. However, it is not so much fun if you have to spend the entire day hauling your beach gear on your back while keeping an eye on the little ones. Therefore, if you plan to haul stuff easily over sand or pebbles, you may need to invest in the best beach wagon on the market today. Our team went to great lengths to find out the top ten beach wagons on the market today to help you make an informed choice when shopping for a good one. We not only researched user reviews and opinions from beach cart experts but also practically tested a few products to come up with this list of top ten beach wagon products available today. The experts tried out a few models to find out how they performed in terms of space, durability, fold-ability, wheels, ease of storage, and other functional issues. A research for reviews and testimonials from users of different types of beach wagon models was also done to finally find out the major pros and cons of each model. The research was especially necessary to help you find the best beach cart depending on your needs and preferences. Our goal is to provide you with a detailed beach wagon buying guide to help you find the most appropriate option for your beach transportation needs. You’ll need a nice folding beach wagon that can accommodate all the stuff you carry along at the beach. This will largely depend on the number of people accompanying you to the beach. A large family needs a larger cart and vice versa. The most important thing is to ensure that the wagon can accommodate your stuff without squeezing or damaging them or leaving too much unused space. Comfort and ease of maneuverability is another important issue to consider. For added comfort, the wagon should ideally have ergonomically designed handles. Go for a beach wagon that is easy to assemble and disassemble after use. A good model should be easy to put together or dismantle with or without a manual. It should also fold easily once you are done with hauling your beach stuff around. An easily collapsible beach wagon is easier to store too. If you can detach the main parts such as the wheels, garbage bag, and handle metal rack, the cart will not take a lot of storage space. The size and design of your beach wagon’s wheels play a key role in moving the entire contraption over sand or pebbles. Large wheels are easier to maneuver and provide a smoother ride than small wheels. So go for the best beach wagons with big wheels, preferably those with knobby pneumatic tires. Keep in mind that the beach wagon is a piece of outdoor equipment that will spend a lot of time under the sun and salty beach conditions. You’ll, therefore, want a durable beach wagon that can withstand the usual wear and tear as well as the sun’s UV rays. Below are our top ten beach wagon carts carefully selected according to the factors discussed above, functionality, price points, and other useful considerations. Made by Mac Sports Brand, of the most trusted camping gear and sports brands, this handy outdoor utility wagon comes in a beautiful blue-colored style. 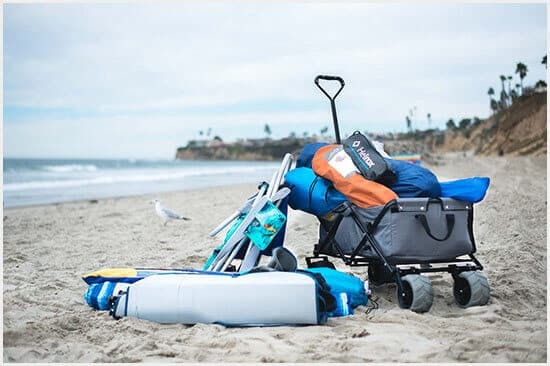 It ranks high in most of the best beach cart reviews found online primarily because of its functional wagon that you can rely on to haul your gear along the beach with much ease. The collapsible folding wagon has an accordion styled floor that makes it extremely easy to set up or fold down. And once folded, the entire wagon conveniently fits in its own carry bag for easier compact storage. It doesn’t require complicated assembly or disassembly. Large rubber tires that can move along sandy, grassy, or pavement surfaces with ease. You won’t need to exert a lot of energy while pushing the wagon along the beach. Its interior has a roomy capacity of 32.5 x 17.5 x 10.5 inches. This is enough space to carry all the stuff you need for a family outing at the beach. You won’t have to worry much about the weight of your cargo since the wagon can handle loads of up to 150 lbs. It folds down to a small compact size of just 8 inches for easy storage, and even comes with a convenient carrying case, which makes it quite easy to transport. Has functional features including an adjustable handle that helps you push it along effortlessly and two mesh cup holders to hold your drinks and beverages securely. Heavy-duty frame and durable 600-Denier fabric. So you’ll be able to use the wagon for numerous beach and camping trips before it starts showing signs of wear. The Mac Sports Collapsible Folding Wagon is a highly functional beach cart. It is great for beach and camping trips, for outdoor events, or even for your home and gardening activities. The TimberRidge TRTR217271BE is a collapsible beach wagon or cart made of a sturdy steel frame. It can be used for multiple uses such as gardening, shopping, or any activity that requires you to move things around. The wagon is a perfect transport solution while camping or spending a day at the beach with your family. One of the best things about this cart is its large and strong interior that can hold all the stuff your family needs at the beach. It has a good weight capacity that can support up to 150 lbs on any hard surface and 110 lbs on soft sand such as the one at the beach. It has a sturdy steel frame supported by 8-inch diameter wheels. The wagon is strong and stable enough to transport large family loads at the beach or while camping. Its large wheels can handle all types of terrains, from pavements and rocky paths to sandy beaches. You can even get inflatable wheels that perform better on sand than the standard plastic wheels. The back wheels are fixed but the front can rotate, giving you better flexibility and easy maneuverability. The wagon has telescoping handles which provide easy control while pushing the cart on any surface. The long handles allow tall or bigger individuals to push the wagon without stopping. The wagon has a 1-year warranty from the manufacturer against any defective material or workmanship. You get it without fear of running into unforeseen functional problems and not knowing what to do next. The TimberRidge beach wagon is a highly recommended solid folding beach wagon for large families. It has a large roomy interior and tall people will find its telescopic handles quite useful. If you are looking for the best beach wagon for soft sand and just about every other terrain, the Tommy Bahama beach cart is a good choice. It is an all-terrain beach cart with extra large wheels that traverse over hard and soft surfaces with much ease. Most users of this wagon talk highly of its functionality. The Tommy Bahama All-Terrain beach cart is designed to haul all your gear to the beach in a single trip. It can carry up to 4 beach chairs and all the accessories you need for a day at the beach. It gives you a perfect combination of roomy utility and ease of pushing over multiple terrains. This Cart comes with a removable insulated cooler tote bag to carry your drinks, beverages, and snacks. The tote bag is completely water-proof. The wagon also features an umbrella holder and plenty of room for balls, towels, lotions, and much more beach gear. It has cushioned handles that give you a comfortable yet firm grip while pushing it over sand or hard surfaces. You can move it along with little effort. Made of durable quick-drying mesh fabric and a strong powder-coated steel frame. Since it will last long, therefore it will save you money in the long run. The best thing about this cart is the large 10-inch rear wheels that make it easy to roll the cart on the sandy and flat surfaces. It gives you an effortless means of transporting your beach needs in a single trip. The Velcro strap is not too strong but it can hold your stuff together without snapping. Most users of the Tommy Bahama Beach wagon expressed satisfaction with its functionality and maneuverability. It has a huge storage space, a built-in cooler, and is quite easy to pull over sand and other terrains. Made by the renowned Rio Brands, the Deluxe Wonder Wheeler Wide is one of the best beach wagons with big wheels for beachcombing activities. The Wonder Wheeler Beach cart is a solid option for anyone interested in hauling their beach gear in one trip. This is a foldable beach wagon with 15-cubic feet of storage and a weight capacity of up to 100lbs. it gives you ample space to carry your gear to the beach or park on a single trip. It can accommodate a 48-quart cooler, 4 beach chairs, and all your accessories. The folding cart comes with large detachable all-terrain wheels that roll smoothly on any terrain. It is designed for pulling rather than pushing. The wheels are also easy to attach. All you need to do is clip the wheels into place and you are ready to go. It has extended handles with neoprene grip. The handles make it easier and more comfortable to pull the cart along the sandy beach surface. The Deluxe Wonder Wheeler Wide wagon comes with a removable tote bag, a bottom tray, a side umbrella, and a convenient rack. You can even use it for moving laundry, gardening, or taking out the trash if so wish. A number of users claim it does not have high-quality construction but so far we haven’t encountered any functional issue with the cart. Online reviews show that most users are extremely satisfied with the Rio Brands Beach cart. Most find it easy to assemble, pull along, and agree that it can carry a lot of stuff. It is an ideal choice for beachcombing activities too. This is a more improved Mac Sports Collapsible Folding Utility Wagon. It comes with more features than the previous model to help you load up all your beach essentials and haul everything to the beach or camp with ease. It’s a collapsible wagon that fits perfectly in your car when you are taking a road trip with the entire family. Notable additions to this heavy-duty Mac Sports wagon are two cup or phone holders that can securely hold your drinks or snacks. It is still the best beach wagon with table extension and other accessories to make your beach outings more relaxed. The all-terrain beach wagon features huge rugged wheels. You can take it over any terrain including sandy beaches without getting stuck. It has a roomy interior with a large 36.2 x 21.4 x 24.59-inch interior. It has a weight capacity of 150lbs or 50lbs in deep sand. There are very few beach carts that can handle such weight in deep sand. With this wagon, you can haul your beach gear anywhere you wish to go. It is a foldable wagon that does not require assembly. You’ll set it up in a few seconds. You can even pull it when it’s folded. The Mac Sports Heavy Duty Utility Wagon provides exceptional value for money. It is durable, versatile, spacious, and can move over every type of terrain. The Ollieroo Folding utility Wagon is designed for use in uneven terrains such as beaches and rocky paths thanks to its thick rubber wheels. The wagon comes in three attractive colors, namely green, red, and blue. The wagon comes with heavy-duty 7 x 4-inch thick rubber wheels that provide easy hauling of load on uneven terrains. You’ll move it along rocky paths and deep sand without much effort. Extremely durable thanks to its powder-coated black steel construction. You can haul a load of up to 150lbs with this wagon. Made of durable 600-Denier polyester. The material is easy to clean too. You only need to wipe it with soap and water to get rid of dirt. Doesn’t require any tedious assembly. You can open and fold it back in a few seconds. It is small enough when folded to fit in the trunk of your car or closet. It even comes with a carry bag for easy transportation. If you are looking for a versatile heavy-duty beach wagon at a good price range, then the Ollieroo Outdoor Folding Utility Wagon is a solid option. The Radio Flyer 3-in-1 wagon is a full-size wagon designed for kids. It has three modes namely for 2 kids riding, bench seating, and flatbed hauling. It folds into a compact size for easy storage or transportation to wherever you plan to spend the day. The wagon modes are interchangeable for greater convenience. As a kid’s wagon, the Radio Flyer has passed the ASTM F963-16 Toy Safety Standard. It even comes with safety belts on seats for additional safety. Its seat backs are well cushioned to provide a comfortable ride for your kids. The wagon has a removable UV protection canopy. The canopy is made from durable DuraClean fabric that can easily be wiped clean with soap and water. It has thick padded seat cushions and soft tires for comfortable quiet rides. Your kids will enjoy the soft ride on sandy beaches. It has telescoping handles too. The handles are extendable enough to make it easy for tall people to move the wagon without stopping. Other features of the wagon include a magnet to hold the handle upright and a folding mechanism that makes it easy to open and fold back the wagon. A few users have complained of its overall weight but it is heavy due to its strong construction and design. The Radio Flyer 3-in-1 EZ Fold Wagon is a multifunctional best beach wagon with versatile uses. You can use it to transport your beach gear, give your kids an enjoyable ride, or simply use it as a beach bench if need be. It is moderately priced too. This is a perfect cart for carrying your gear to a camping site, beach, or any outdoor event. It is an attractive wagon with mist finish tubing enhanced by silver or gray mesh and black fabric. It is a beautiful transport mode for your outdoor gear. The best part about this wagon is its ultra-wide wheels. They won’t plow or sink on the sand while carrying your beach gear at the beach. Its pivoting 4.5-inch front wheels provide easy and comfortable navigating. The wheels provide smooth and easy rolling on most terrains. Folds into a compact flat package for easy and convenient storage. It won’t take up much space in your car trunk or closet. Its frame comes already assembled and all you need to set it up is to snap on the wheels. You don’t have to spend hours assembling the wagon. Spacious enough to hold up to 4 beach chairs, a large cooler, and your beach gear. It has a weight capacity of 77lbs. Extended neoprene handles for easier and comfortable control. Doesn’t require a complicated setup. It folds out and back easily. A few users have claimed its front wheels sometimes get wobbly in deep sand but the back wheels are strong enough to get you through any terrain. This cart is a great option if you are looking for a perfect replacement for your old beach wagon. It traverses through every type of terrain with ease. If you are looking for the best folding beach wagon with canopy, this attractive red-colored Radio Flyer Deluxe All-Terrain family wagon is a great choice. It comes with air tires for a smooth ride on different surfaces and a strong canopy that protects your items from the sun’s UV rays. It is a versatile wagon with numerous uses besides carrying your beach gear. First of all, The wagon has five seating and storage options. The options include ample seating for two, a flatbed for carrying your beach gear, covered storage, an activity surface, and extra large storage and riding space. It is a versatile wagon with enough space for kids to ride in and hold your beach gear intact. The wagon comes with seatbelts for additional safety for your kids. It has cup holders to hold your drinks securely. The cup holders provide easy access to snacks and drinks. Its fold-over handle provides easy and more compact storage for the wagon when not in use. The wagon has all-terrain air tires that ride smoothly on different surfaces. You can easily push it on deep sand and rocky surfaces without getting stuck. It has a removable canopy that is not only easy to clean but provides protection against the sun’s UV rays as well. The seatbelts are wide set and a bit low for kids but provide additional safety nevertheless. This is an awesome wagon with heavy-duty wheels and a removable canopy. It is easy to assemble and can be used for numerous purposes. It is also made of strong durable materials. Looking for one of the beast beach carts with balloon wheels, then the Challenger Mobility Folding beach cart is a good option. It is a great caddy that you can rely on to transport beach gear or cooler for any outdoor event. You can fold it into a compact size for easy storage and can even fit it in the trunk of a small car. The Challenger Mobility Folding Beach Cart comes with large balloon tires that will not get stuck or sink down sandy surfaces. The super large balloon wheels allow it to roll along smoothly on sandy or rocky terrains. With this truck, you’ll skim over sand or gravel with ease. The wheels can be detached for more convenient storage or transportation. It has an excellently built sturdy tubular construction that ensures the wagon lasts for many years. It can carry the weight of up to 165 lbs yet it only weighs 18lbs. Its bottom platform folds up easily for easier storage. Has a telescoping handle that can stretch from 29 inches to 49 inches. The handle has an ample extension range for different sized people. The wheels require an air supply, however, a simple bike pump will do. The Challenger Mobility Folding Cart is a great option for heavier loads. It can carry your beach chairs, umbrella, and other beach items and still remain with plenty of space left. The balloon wheels can roll over any surface with ease. All the beach wagon carts discussed above are made for diverse uses including beach outings, shopping, gardening, and even moving items over snow-covered tracks. They all have a sturdier, more solid, heavy-duty construction complete with durable polyester fabric and giant wheels that can roll over any surface without a problem. Each of the carefully selected wagons meets all the conditions mentioned in the introduction of this article. They are all designed to solve the tedious problem of hauling your beach gear across the beach when you go o the beach with your family or friends. Check out which wagon suits your style and budget then let us know in the comments below.